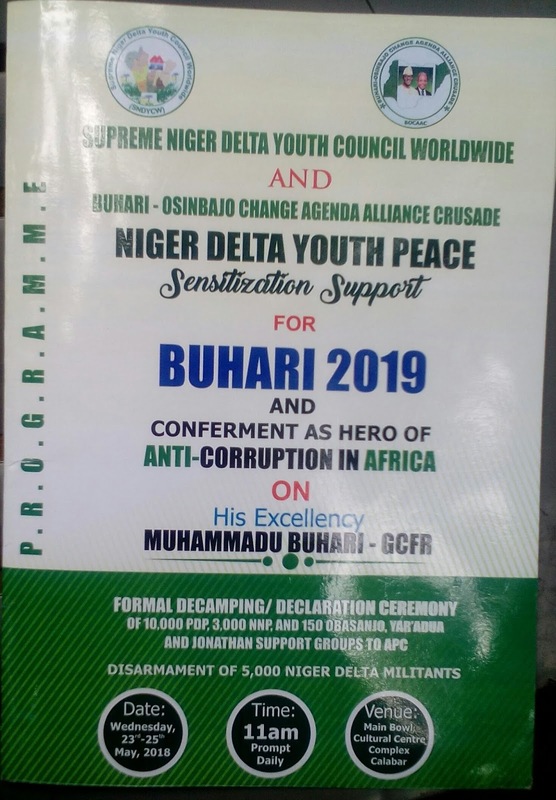 Asserting that President Muhammadu Buhari's giant strides in the anti- corruption campaign must be on irreversible gear, the Supreme Niger-Delta Youths Council Worldwide, SNDYCW, has jump started its machinery in support of his second term ambition. To this end, SNDYCW and Buhari-Osinbajo Change Alliance Crusade, BOCAAC will on May 23-25, 2018 organise a 3-day Niger Delta Peace Conference and Sensitisation Mega Rally to mark President Buhari's 3 years in office. The event holds at the Main Bowl, Cultural Centre Complex, Calabar, Cross River State. The mega rally with the theme, ‘The Change Agenda That Must Succeed' will also witness the conferment of ‘Hero of Anti-Corruption in Africa' on the President. Chief host of the event and facilitators respectively includes Chief Okoi Ofem Obono-Obla, Senior Special Assistant, (Prosecution) to the President, and Rt Hon. Gideon N. Sammani, Senior Special Assistant to the President, (Political), office of the Secretary to the Government of the Federation, SGF, and Hon Ayuba Burma, Special Assistant to the President on Political Matters, office of the SGF. In an interview, Supreme Leader of SNDYCW and Convener of BOCAAC, Prince Michael Newgent Ekamon, told theledgerng.com that the Niger Delta Youths are convinced that President Buhari has dealt a decisive blow to corruption in the Country. “The SNDYCW are fully in support of President Buhari's second term ambition, and we are mobilising for its realisation. We believe his return for a second term will not only put the anti-corruption campaign on irreversible gear, but will lay a firm foundation for accountability and transparency in public office. The rally will also witness the decampment of over 10,000 PDP members to the APC, and the fusing of 150 supports groups of former Presidents Olusegun Obasanjo, Musa Yar' Adua and Goodluck Jonathan to the BOCAAC. 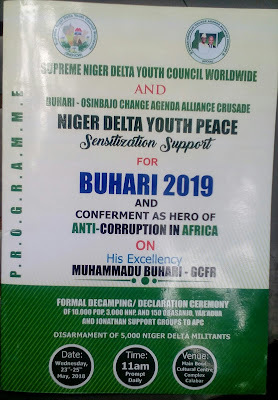 Other activities planned for the rally includes the disarmament of over 5000 repentant Niger Delta militants and their induction into the BOCAAC.